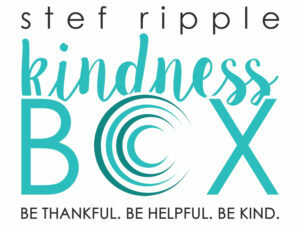 The Stef Ripple Kindness Box is a small gesture to help provide support, hope and encouragement to cancer patients. During Stef’s cancer journey there were many things that were important to Stefanie and we feel like she would want to share these things with other ovarian cancer patients. – Small teal items that will bring a smile to an ovarian cancer patients face! Please email us for information on where to drop off donations. Thank you for helping Keep the Ripple Going and supporting ovarian cancer patients! Check out our Facebook page for photos of our first box making night!